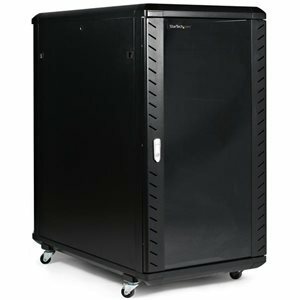 Store your servers, network and telecommunications equipment securely in this 22U solid steel rack. This server rack provides 22U of storage space in a sleek secure cabinet for storing EIA-310 compliant 19" rackmount devices such as Dell, HP and IBM servers along with telecommunication and A/V equipment. The rack creates a robust storage solution supporting a total load capacity of 800 kg. (1763.7 lbs. ).This rack has been engineered with different features that enable you to easily incorporate plenty of equipment.With adjustable mounting rails you can easily change the rail depth to up to 28.7 in. (730 mm). These rails ensure the cabinet is widely compatible with your standard rackmountable equipment. The added depth also provides support for additional cable and power management behind your equipment.The rack features brushed ports on the ceiling and floor panels that enable you to easily run cabling to the inside and outside of the cabinet, for discreet cable management. The floor and ceiling panels can also be removed enabling you to customize your setup, and the rack features grounding lugs that enable you to ground your equipment for added protection.To ensure you have full visibility of your equipment while securely locking it up, this rack has a stylish glass window on the front door. The glass door looks great in any server room, and gives you the freedom to clearly monitor equipment without the hassle of opening your rack.The rack also has removable side panels with independent locks quick-release mechanisms that enable you to easily access your equipment while still keeping it secure.The cabinet comes in a flat packed box to reduce shipping volume, which significantly reduces your costs in shipping. Plus, because the rack is packaged efficiently, you can easily store the cabinet, for deployment at a later date.The cabinet features casters ensuring hassle-free access to the rear mounted equipment, while providing ease of mobility around your office, studio or server room. Plus, the width and height of the rack fits through standard doorways, giving you the freedom to wheel your server rack into different rooms.The rear door on the rack is mesh, and the front glass door is vented, working together to increase airflow to provide passive cooling that's cost effective and ensures your equipment runs at an optimal temperature.The top ceiling panel features square venting holes that are cage nut compatible, which provide mounting points that enable you to add additional equipment at the top of your rack. The rear door on the rack is mesh, and the front glass door is vented, working together to increase airflow to provide passive cooling that’s cost effective and ensures your equipment runs at an optimal temperature. The top ceiling panel features square venting holes that are cage nut compatible, which provide mounting points that enable you to add additional equipment at the top of your rack.